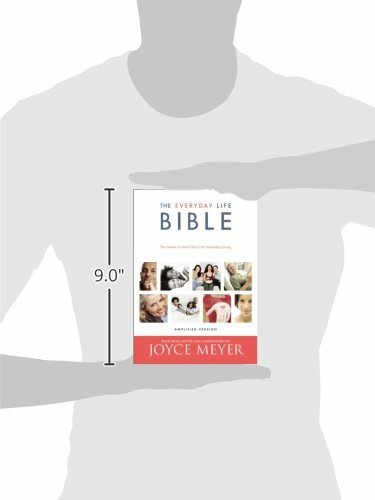 As one of the world’s most recognized and respected Bible teachers, Joyce Meyer’s insight on Scripture is an invaluable resource to many students of the Word of God. 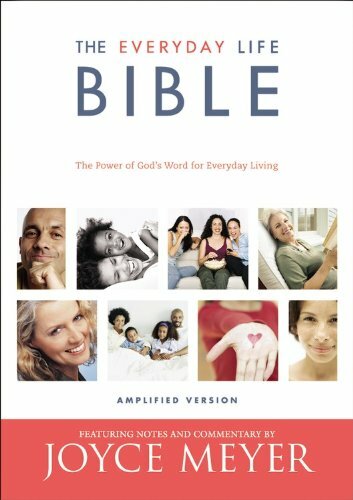 THE EVERYDAY LIFE BIBLE is your tool for understanding and cherishing the Bible as deeply as Joyce does. Her well-researched knowledge of Scripture and her passion for weaving the Word of God into daily life are inspiring companions to the Amplified Version of the Bible. The Bible can be difficult to read and comprehend. Joyce has chosen the Amplified Version for her personal use because of the words added to the text to illuminate the meaning and to enhance understanding. Joyce’s goal in offering this unique Bible with her notes and comments is to build sturdy bridges between the words of the Bible and your everyday life. Book Introductions–Joyce’s thoughts on why each book is important and how it relates to practical living. Everyday Life Articles–Highlights of Joyce’s teachings to help you apply specific biblical truths to your life. Life Points–Short quotes and comments from Joyce offering you encouragement and wisdom during challenging times. Putting the Word to Work–Questions that enable you to evaluate your life in light of biblical truth and instruction. Speak the Word–Verses adapted to be first-person confessions or prayers, bringing biblical promises to a new and personal level. Joyce’s no-nonsense approach to life has endeared her to millions as a teacher, mentor, and friend. Having her thoughts and teachings accessible as you study Scripture will give a new dimension to the words of life and you’ll feel as though you have Joyce as your own study partner.